IMC Glass work closely with BSI and have independent testing on our products carried out twice a year as per BSEN1279 part 6 Annex B Audit test. Our quality management/production systems are also independently audited by the notified body (BSI) to ensure the on-going quality of our products. To manufacture double glazed units, certification is required for BSEN1279 Part 2, production quality and BSEN1279 Part 3, which relates to gas leakage at less than 1% per annum. Certification is your guarantee of quality and reliability. It is a legal requirement that all double glazed units must have CE mark in accordance with construction products Regulation declaration of performance. Safety glass required for all door and sidelights and any glass in a window below 800mm from the floor and can be toughened or laminated glass. Laminate glass has less breaking resistance than toughened glass. Laminated glass will provide protection to internal furnishings as Ultra Violet radiation is reduced by 98/99% and a slightly better acoustic rating. All Double Glazed Units can be constructed with any type of glass or thickness. The width of the cavities determine the insulation or U Value, the thickness of glass has no effect on U Values. All simulations of U-values can be available on request. • Hodgson flexistrip a security glazing strip for double-glazing units and laminated glass. • Hodgson butyl 66 Dry seal mp manufactured by repaircare a non-linseed based product manufactured by repair-care which is a durable alternative to putty. Slim Glaze units to be bedded in back rebate with approximately 2mm of butyl (non-hardening compound) or with flexistrip and centred in rebate with spacers or packers, (the latter not required if using flexistrip) to keep the unit raised from the rebate platform completely fill the void area with silfix silicone and allow to completely cure. The units can then be putty fronted using one of the above product’s making sure there is full adhesion to the frame and glass and no areas for water to enter the glazing system. using nails or screws and sealed with Silfix U9 low moisture Silicone to completely seal any residual voids between glass and rebate and glass and bead. Finish with paint application making contact with glass both inside and outside. It is very important that regular maintenance of the frames and glazing system is undertaken to prevent the access of water into the glazing system. The major enemy of insulated glass units is water. If water is trapped in contact with the seal of the unit for a period of time, the unit will fail. All glazing systems must protect the edge of the insulated glass unit, either by preventing access of water or by proper drainage and ventilation. Some silicones are not suitable for use with sealed units. A silicone component (plasticizer) can migrate to the primary seal causing catastrophic failure of the unit, if in doubt please contact your supplier before installing. 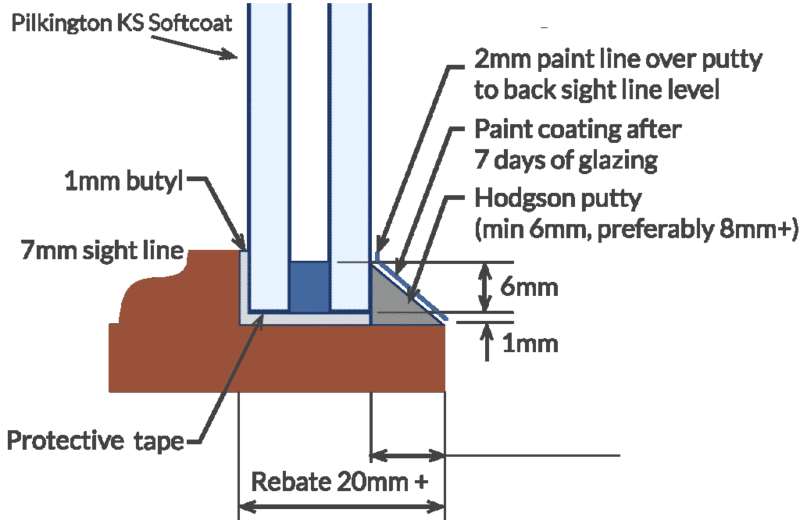 To obtain maximum life expectancy for sealed units, it is essential that water is prevented from leaking round the glazing putty / gasket into the frame and lodging there. Glazing and maintenance recommendations must therefore be carried out in accordance with the unit maker’s instructions. The schedules of maintenance detailed below refer to commonly used and accepted glazing systems are approved by the Glass and Glazing Federation for houses and low rise buildings. Where other systems have been used the unit maker should be consulted for advice on maintenance. Glazing should be inspected at least annually and treated as necessary. non-setting compound or silicone sealant, preferably the same as originally used. Always use non-setting glazing compound for back bedding repair purposes. When pointing non-setting glazing compound between the beads and glass ensure that, the compound slopes away from the glass. When using silicone sealant ensure that the sealant is proud of the glass, this will prevent water lodgement occurring. Standard units fitted into frames with beads, using gaskets or mastic load bearing strips: this system is normally used for glazing into aluminium and uPVC window and door frames. Check annually for obvious deterioration and ensure that all drainage holes are free from obstruction. IF A SERIOUS FAULT DEVELOPS INFORM YOUR SUPPLIER AT ONCE.